One of the most common news stories about the Catholic Church in recent years involve parish closures. These events often gain local attention and time from time get coverage nationally. When the story is national, the closure(s) sometimes seems as if this is something generalizable. The national data seem to fit this characterization with the Church now operating 1,437 fewer parishes than it had in 1971. What often gets lost in these stories (and in the national numbers) is that closures are a much more regional and local phenomenon. CARA has often referred to a “Tale of Two Churches” (1, 2) where pastors in different parts of the country tend to be worried about different things (keeping the lights on vs. finding space for more pews and parking spaces). The net loss of parishes has been most heavily concentrated in dioceses in a handful of states. 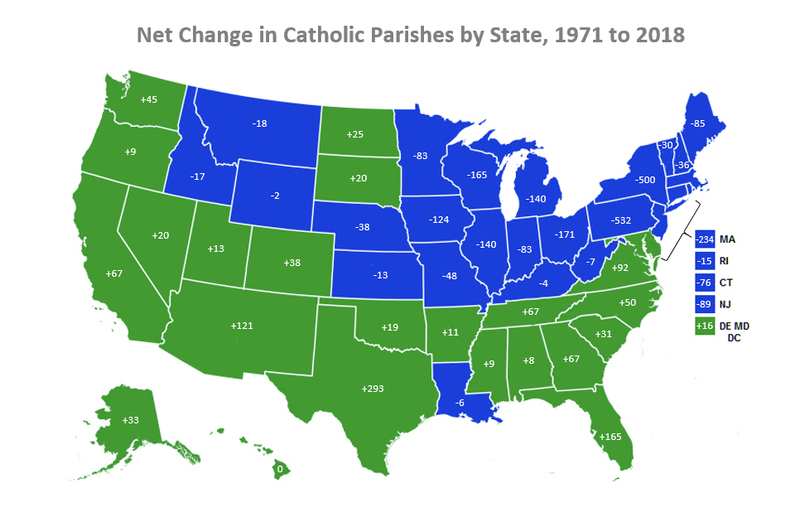 Really two states lead the pack in reducing their numbers of parishes. Pennsylvania has reduced its number of parishes by 532 since 1971 and New York by 500 during the same period. Other states have experienced increases in parishes, offsetting some of these losses including Texas, which has added 293 parishes, Florida which has added 165 parishes, and Arizona and New Mexico (the Diocese of Gallup crosses state lines) which added 121. The states in blue on the following map (click the map to see a larger version) have fewer parishes now than they had in 1971 and those in green have more now than in 1971. The pattern in parish losses and gains follows economic and social mobility changes in the country more generally. The Sunbelt in the South has attracted population growth while the Rustbelt in the Northeast and Midwest have seen population drains over the decades. The Catholic Church, diocese by diocese, has responded to these changes by closing parishes in areas with losses and opening them in the states where population gains have occurred. It is important to note that these population gains have also included new arrivals from outside the United States as well. In some urban dioceses that attracted the first waves of Catholic immigration from Europe in the 19th and 20th centuries, churches were built to serve the needs of people from particular countries like Italy, Poland, Germany, and Ireland. 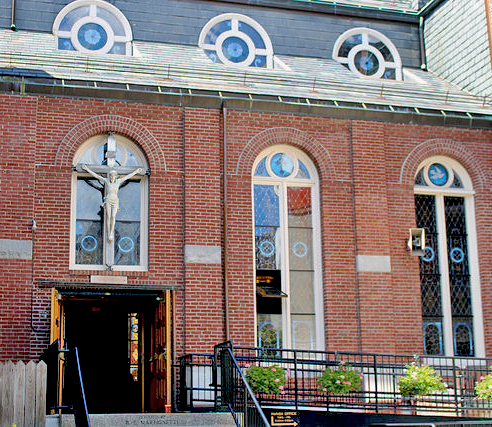 In some cases, parish buildings were built in close proximity to each other in cities catering to the language and culture of the specific immigrant groups needing pastoral care and access to the sacraments. Now many years removed from this immigration and often with Catholics having left long ago for the suburbs or the Sunbelt, parish buildings are underutilized. This is part of the story of what happened with some of the parish closures in areas of New York, Pennsylvania, and Massachusetts. In some other areas, shortages of priests have led to reorganizations that involve parish closures and clergy being assigned to administer multiple parishes. However, there are limits to how many parishes a single priest can realistically administer geographically. Finances also play a role. Since 2000, the average Catholic family has given $10 a week to their parish. In some cases, the number of these active families present in parish communities are not sufficient in numbers to make the operation of a parish viable in the long-term. Closures here have also been made due to this lack of funding. In many ways, it has been easier for the Church to close parishes than build new sites. While growth is evident throughout the South (outside of Louisiana) and West, the Catholic population of this region has increased much more quickly than new brick and mortar construction. Nowhere is this more evident than in Georgia where the Catholic population has increased from about 110,000 in 1971 to more than 1 million today (+858%). 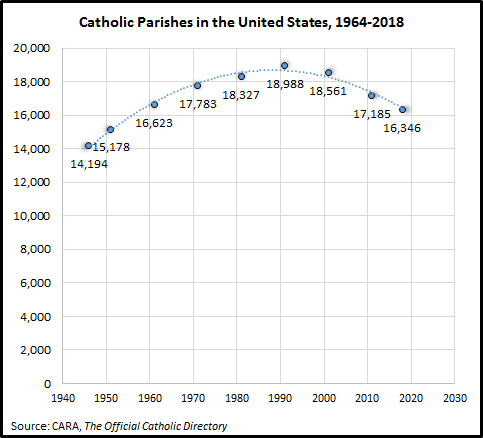 While the state has added 67 parishes during this period, the number of Catholics per parish has increased from 1,396 in 1971 to 7,235 in 2018. States with fewer Catholics today than in 1971 include Pennsylvania (-17% fewer), Rhode Island (-17%), Michigan (-16%), Vermont (-16%), Massachusetts (-14%), Louisiana (-10%), Ohio (-9%), Connecticut (-9%), Illinois (-4%), North Dakota (-2%), and Wisconsin (-2%). Other than Georgia, states with significantly more Catholics now than in 1971 include North Carolina (+922% more; 73,600 to 752,500), Nevada (+635%), South Carolina (+582%), Utah (+370%), Florida (+298%), Tennessee (+285%), and Virginia (+265%). New York has experienced no real net growth nor loss in the total number of Catholics residing in the state. Thus, there is more to the story of parish closures in New York than simple population change. Here, the geographic distribution of this population and of the parishes (particularly in urban areas) is likely central. It is also important to note that even with the net loss of 500 parishes in New York, there remains 1,203 parishes open and the number of Catholics per parish has only increased modestly from 4,048 in 1971 to 5,743 today. By comparison, in Nevada, a state that has gained 20 parishes since 1971, the number of Catholics per parish today is 12,639. Parish photo courtesy of Massachusetts Office Of Travel & Tourism.